You could implement an enterprise solution customized for distribution without the risks of traditional software deployments? That solution required minimal upfront investment-keeping capital free for other ventures? Instead of managing integrations and hardware, your IT employees could focus on productive, strategic business activities? Are you ready to modernize your business? As a wholesale distributor, the challenges you face today are forcing you to rethink the way you do business. Old processes and approaches just don’t cut it anymore. Neither do legacy ERP systems. You need a solution that drives the rest of your business to be even more agile than the people and processes it supports. Modernize your business and take it to the next level with Infor CloudSuite™ Distribution. "Infor CloudSuite Distribution Handbook" is ready for download. Please fill out the form below. To view the full handbook. Aktion is a national IT consulting firm specializing in the Distribution industry. By working closely with our customers and vendors, we better understand their needs and provide them with the services they’ve come to expect from Aktion. 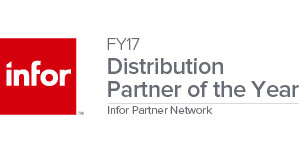 Serving our ERP customer base for over 20 years, with a level of skill and dedication that has seen us grow to become Infor’s largest North American Channel Partner for Distribution. Aktion is committed to customer satisfaction. Watch a short half-hour webinar specifically on Infor CloudSuite Distribution and Aktion or register to watch this webinar live. With presenter & Account Manager at Aktion, Rob Dallas giving valuable insight into Infor CloudSuite Distribution and the Aktion difference.